The 67th annual Ryse Williams Pacific Shores Tourney was held last week (November 12-17, 2018) @ Redondo Union High School (Redondo Beach CA). The Pac Shores tourney name was modified recently to honor the legacy of former Redondo Union star (and Loyola Marymount signee) Ryse Williams who passed away in July 2017 due to a rare form of childhood cancer: renal medullary carcinoma. Tourney MVP 6-1 2019 Ethan Anderson (UNLV signee) scored 27 points and 6-4 2019 Robert McRae added 16 big points of his own as Fairfax (Los Angeles CA) ran out to an early big lead over short-handed Bishop Montgomery (Torrance CA) and held off a late 2nd half rally by the Knights to prevail 64-56 in title game. 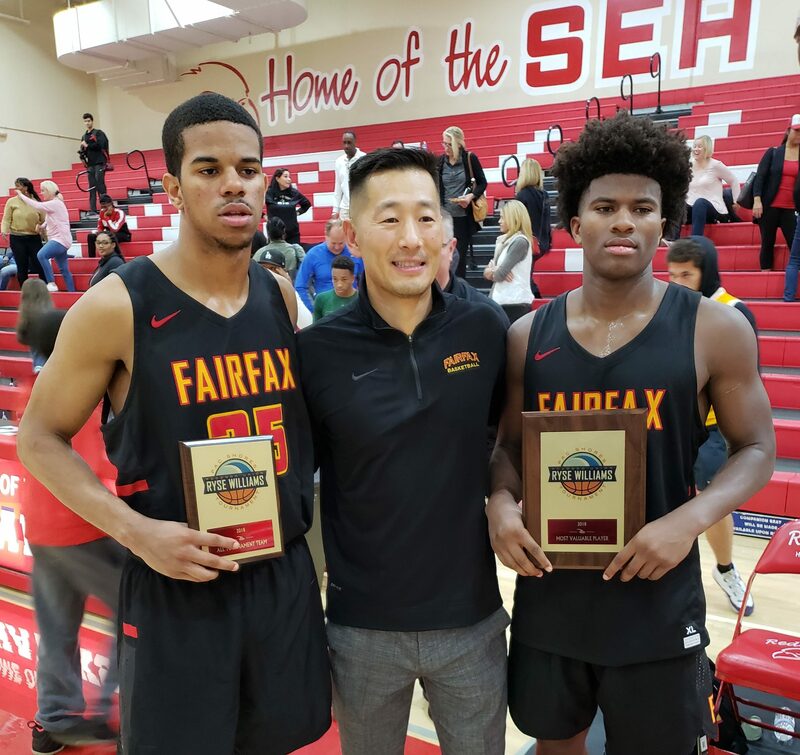 Fairfax’s intense, swarming team defense allowed Bishop Montgomery very few good looks at the hoop and the Lions’ excellent ball-movement on the offensive end provided Steve Baik’s squad with lots of high-percentage buckets. Fairfax looks to get even better next month when talented 6-2 2020 guard Keith Dinwiddie (Culver City transfer) gets eligible. Playing without injured Oregon State-bound 6-2 2019 PG Gianni Hunt and yet to be eligible 6-7 2020 Crean Lutheran transfer Isaiah Johnson (will be eligible in mid-December) as well as suffering a title game 1st half injury to key player 6-5 2019 Nick Schrader (hurt knee in 1st half and did not return), the Knights fought back in the 2nd half behind the offensive contributions of 6-3 2019 Josh Vasquez (15 points), 6-6 2019 Will Crawford (15 points) and 6-8 2020 Bradley Ezewiro (13 points). In the 3rd place game it was upstart Washington (Los Angeles CA) outlasting Notre Dame (Sherman Oaks CA) 66-56 as 6-1 2019 Hansen Clarke led Washington with 19 points and one of the nation’s top juniors 6-7+ Ziaire Williams led Notre Dame with 26 points. In the 5th place game, Santa Margarita seniors Jake Kyman (27 points/11 boards) and Max Agbonkpolo (23 points/12 rebounds) sparked the Eagles over tourney host Redondo Union (Redondo Beach CA) 68-56. Rolling Hills Prep (Palos Verdes CA), behind JT Tan’s (23 points/21 boards), was a 52-47 winner over Birmingham (Van Nuys CA) in the Consolation championship game. In the Small Schools Division, it was University (Los Angeles CA) behind David Cheatom’s 12 points, 13 rebounds & 5 assists knocking off Price (Los Angeles CA) 67-41. Strong and explosive lead guard has the strength and bounce to finish at the rim as well as the range to knock down long-range perimeter shots. 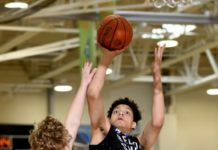 UNLV signee plays with ultra-confidence and is a pesky defender. 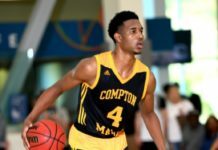 Tourney MVP had 27 points in title game win over Bishop Montgomery to follow-up his 32 point scoring outburst in a semi-final win over Sherman Oaks Notre Dame. One of SoCal’s top unsigned seniors is a “jack of all trades” guard that affects the game in so many ways. Consistently a great defender, McRae held talented 2020 prospect Ziaire Williams in check for most of Fairfax’s semi-final win over Sherman Oaks Notre Dame. Underrated 3-point shooter as well as passer had 16 points in title game (11 of them in 1st half when his Lions took a commanding early lead). McRae (an all-tourney selection) also grabbed 8 big boards. Very talented wing forward with the athleticism, length and pure shooting stroke to play at the highest college level. Arizona, UCLA, USC, Stanford, Oregon, Virginia and Cal are among the growing number of schools that have offered this excellent student. His 36 points in Notre Dame’s quarter-final win over Santa Margarita and 26 points in 3rd place game against Washington will go down as two of the best individual offensive performances in recent PacShores tourney history. One of the top shooters as well as sleepers in the nation erupted for 34 points (8 “threes”) in semi-final loss to Fairfax. 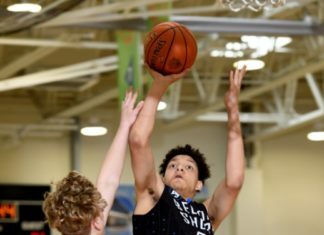 Boston College signee has crafty and elusive ball skills with the ability to create his own shot. Rishwain (a very good student) was also impressive in Notre Dame’s 74-62 win over Santa Margarita (26 points). Skilled and athletic WF is headed to USC next Fall. 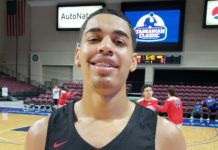 Max is a polished scorer both off the dribble as well as spotting up and once he adds additional weight and strength he will be an offensive threat in the Pac-12. All-tourney pick ended week on a high note with 23 points/12 boards in win over Redondo Union. UCLA-bound wing forward with terrific outside stroke had that jump shot dripping here! Started senior season with an impressive 30 point outburst in 1st round over Garden Serra and finished with a game-high 27 points in 5th Place Game win over Redondo. Strong and springy PF with great claws that allow him to catch and finish in the paint with authority. Coming off Doug Mitchell’s bench for now but when he gets comfortable with this team (transferred in from St. Anthony/Long Beach CA) he will be a force down the stretch for Bishop this season. Scored 13 points (8 of them in the 4th quarter) to keep the Knights in contention with Fairfax in title game. Son of legendary Los Angeles baller John Williams (Crenshaw HS/LSU/NBA) is one of SoCal’s most improved players and a big time sleeper poised to be a valuable Spring 2019 D-I recruit. Daylen has sprouted to 6-7+ and is active on the glass with more than ample athleticism to finish above the rim. Upside here is real and warrants close monitoring this season. Confident playmaker and scorer is also a deceptive athlete (had a monster jam in semi-final win over Washington). Montana signee was an all-tourney pick. All-tourney selection is a well-built wing that is a very nice slashing scorer and harassing defender. Prior to going down with a knee injury in the title game against Fairfax, Nick was extremely productive all-tourney long as was exemplified by his 22 point/6 rebs/5 assist winning effort over Redondo Union in tourney quarter-finals and had an eye-popping 19 point explosion in the 1st half of the Knight’s opening round win over Southeast (South Gate CA). Agile and active wing with underrated perimeter shot dropped 25 points in win over Lynwood. Father Derrick Jones played at Cal State Fullerton in late 80’s. Rancho Dominguez Prep (Long Beach CA) transfer is a very versatile, multi-positional perimeter player with excellent long-term upside. Crafty young lead guard had 30 points in tourney win over Harvard-Westlake. Confident scorer had 21 points in opening round win over Birmingham.